Bas posted some great photos in the other thread, but I figured this kind of stuff deserves its own thread. Nice finds! All civil war i presume? What metal detector do you use? It's pretty much all civil war era except for the BPOE Medallion on the left. I borrowed an inexpensive bounty hunter metal detector. You don't really find anything prior to the mid 1800's here, except the occasional stone projectile point, there just wasn't anything here. ~ Just sayin' !Edited 1 time(s). Last edit at 05/06/18 04:22PM by modspernut. Sabsonette guy? Those objects must be over ten thousand years old,right? Have Bas carbon date them for you. LOL! Didnt find much today, but this was pretty sweet. 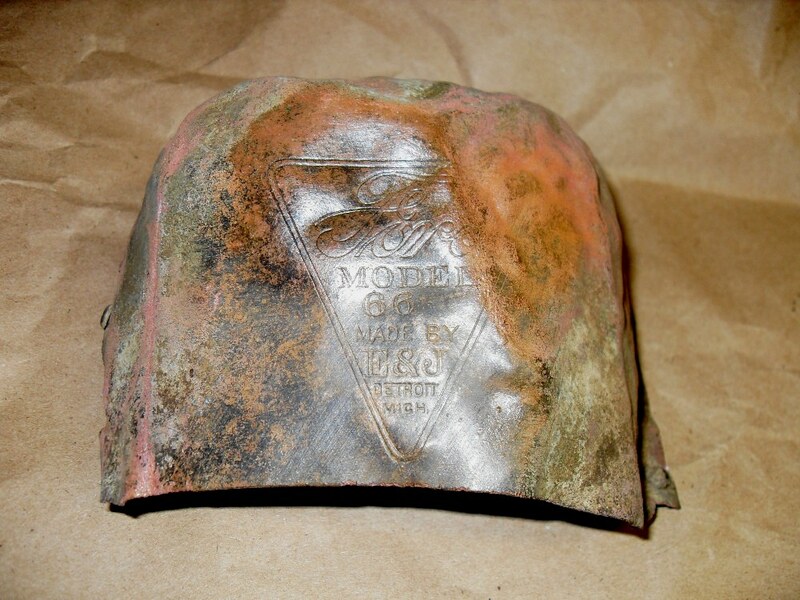 Its a copper cap from a lead weight, stamped with my towns coat of arms (twice) the date 1647 and an assayers mark. You dont find these things very often. 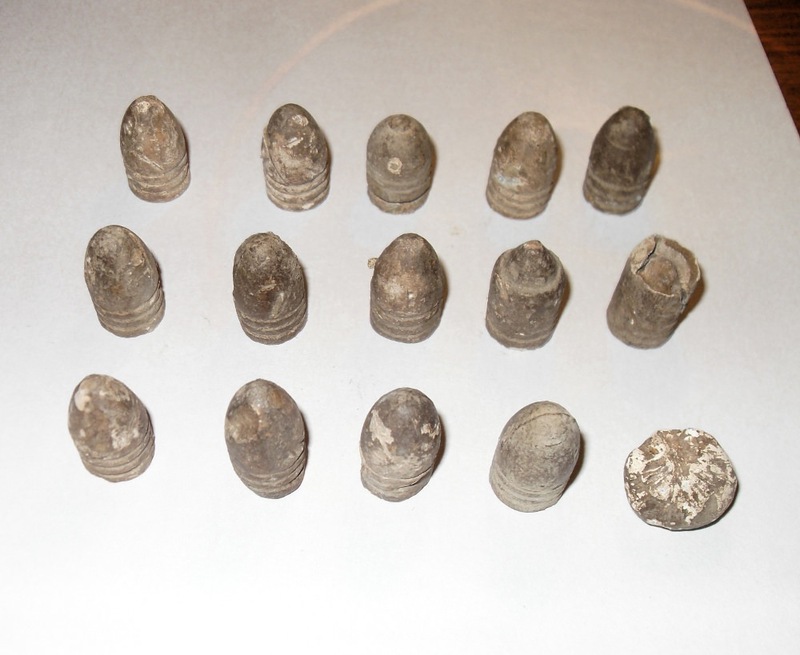 Have you ever found a rusty nail or a bottle Cap? That would be cool. I dug this sweet green beryl up at an old feldspar mine last year. broke in three peices, but after two days trying to get it out, my patience wore thin. Thats awesome. I like finding brass and copper, the stuff basically lasts forever. > Didnt find much today, but this was pretty sweet. A commemorative hanger to celebrate its been 50 years since the battle of waterloo. Bas, southern Ohio is littered with Native American arrowheads. Farmers and land surveyors usually have hundreds. Also the last ice age pushed massive amounts of earth into that area and teeth and tusk of woolly mammoths have been found in creek beds. Being able to collect arrowheads like that would be awesome. In the Netherlands stone arrows havent been used for over 2000 years so you wont find that many of em. One of the things i kind off collect is clay pipes. The nice thing about them is you can easily date them by size, shape and makers mark. The smallest one (top left) is from the 16th century while the largest one (bottom right) is early 20th century.Edited 1 time(s). Last edit at 05/13/18 10:17AM by dutchpuch. We bought our house about 5yrs ago. It was built in 1860 as a hotel. A few times during the summer months my buddy brings his metal detector over and we put holes all over my yard. He has to "dial out the trash" on the detector so we're not digging up roofing nails and aluminum foil, but we've dug up a hand full of pennies,dimes, and quarters over the years, most of them dating around 1895-1920's. About 2 weeks ago we dug up the oldest one so far. An 1882 penny about 8 inches deep and 5 feet from the front porch. Still have yet to dig up a nickel. Man, it seems we share the same hobbies, I have several metal detectors and I collect everything old, have many fossils too. Plus, of course, old mopeds. Regards. I found a dead moped website .. all encrusted in debris .. I live near a flourspar mine and an ancient native American campsite. It was once the bottom of the ocean so there is all kinds of stuff here. Gastropod cast, dino bone, ammonite, flourspar, quartz and calcite. this thread rules! one of the swoops Andy Cohen (not simpson) is real into metal detecting stuff and is pretty badass. You ever watch the show Dectorists? it's pretty great. the main guy Andy in the show kinda reminds my of Pat Norris sometimes. I started digging a row of holes in my lower yard yesterday to transplant some black raspberries. In the very first hole i dug up a piece of glazed pottery about 6-8" deep. After digging 20 holes, i found a bit of something in almost every hole, and a lot of coal ashes. Our house was one of the first houses built in this town back in 1860 and appearently my back yard was the local landfill. While digging one hole i pulled up an end cap for an Eveready flashlight. After a little research, i found that they used the vertical line pattern from around 1929, and around 1937 they added "Made in USA" to it. This one is stamped with the USA script so i'll have to do a little more research to figure out when the design changed again. 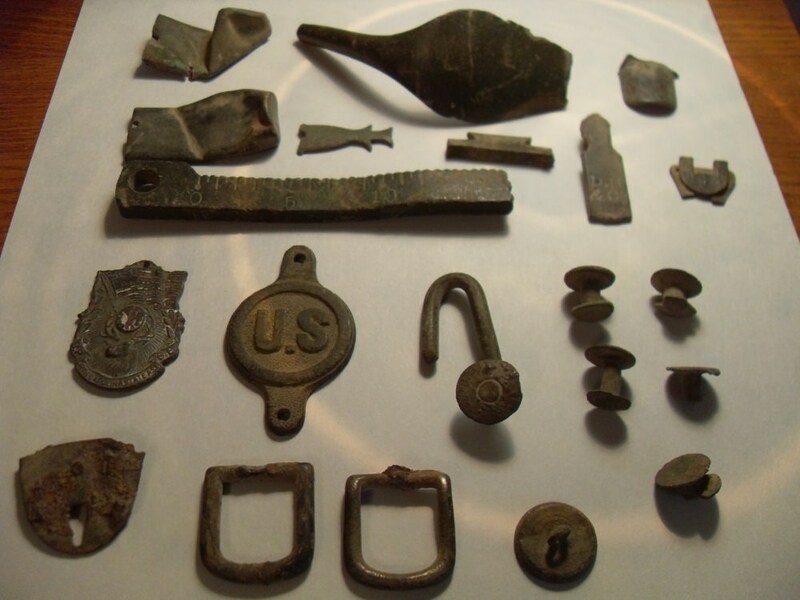 I had my buddy come up today to scout around with his metal detector and he found a few items. 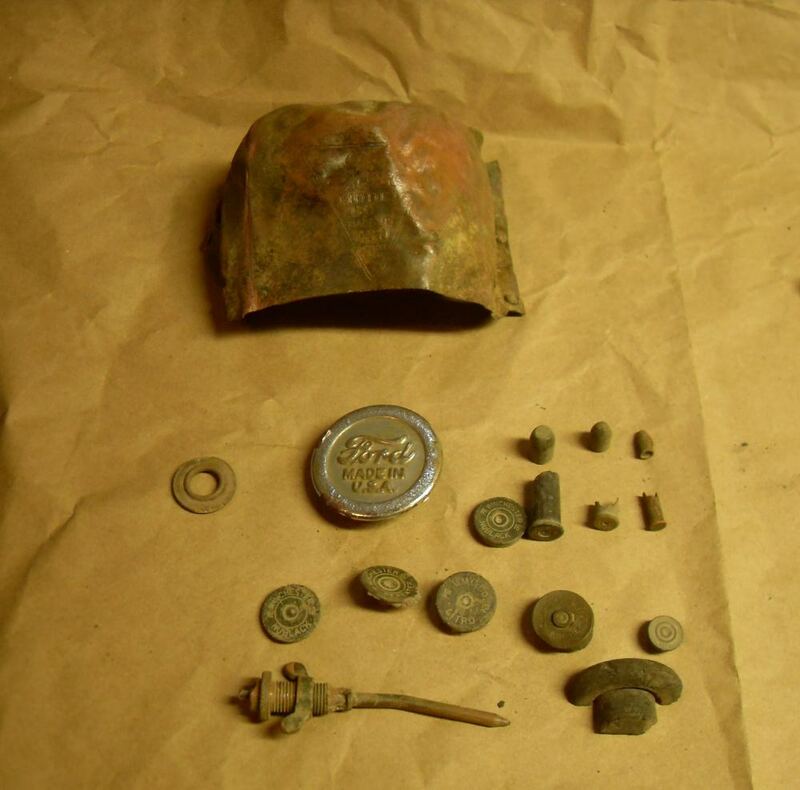 An ornate back of a pocket watch, a buckle, several nails, half of a leaf spring ply, half of a pair of binoculars, canning accessories, and a few 12 gauge shot gun shells. The Remington UMC "Nitro Club" has Remington UMC printed on a band around the shell. I've never seen that before. Another round item that appears to be the bottom of a container is stamped "Magic" with a patent date of July 30,1901. His interest is finding coins. nothing special today but least he found a 1982 penny and a 1966 dime. He'll be back. Better luck next time. When he comes back,if he didn't know this, have him check at the base of any trees or stumps or near old chimneys, outhouses, smokehouses. A friend of mine told me that's where he finds old coins and other valuables on old farms and buildings. Here's some early ford parts including the chimney for a teens carbide headlight. A few various casings and bullets, some sort of needle valve, and half of a rubber stopper. Three axe heads, including two badly damaged from driving stakes or wedges. 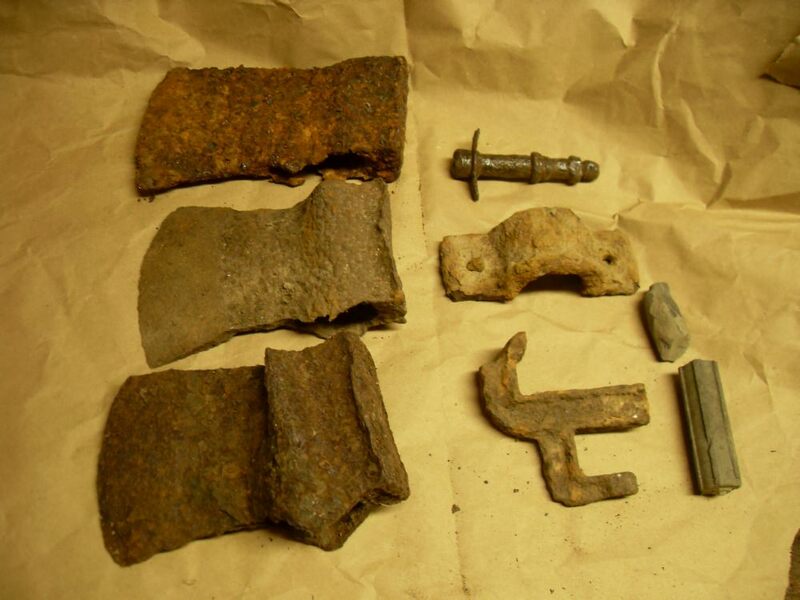 These two worst ones were found near a civil war campsite. On the right a 1890's-early 1900's bicycle pedal, Tobacco truck axle hanger, part of a tiny bench vise and some carbon rods from old dry cell batteries. 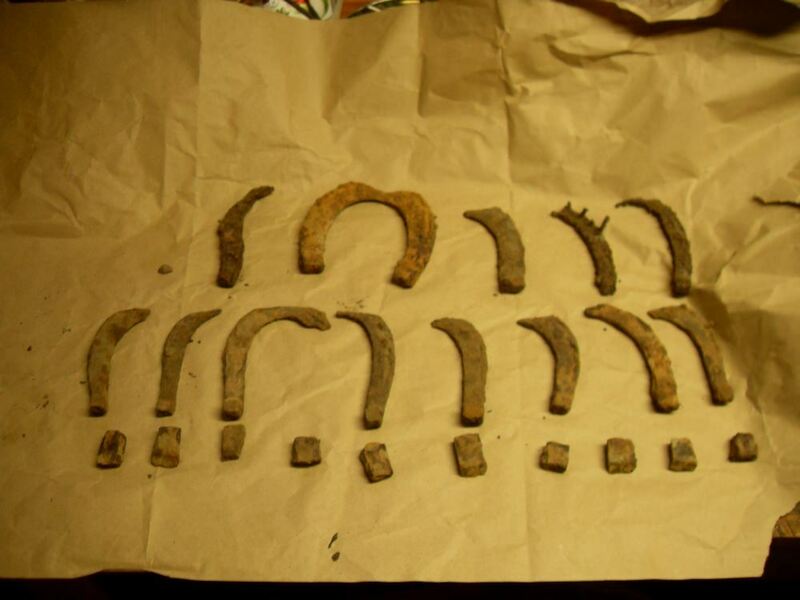 I found a pretty decent pile of horseshoes and some cut-offs in the same spot, which leads me to believe somebody stopped and shoed several horses/mules. Edited 2 time(s). Last edit at 05/28/18 05:49PM by saabsonettguy. "Magic" identified. Salt & Pepper shaker, well the bottom half. Great haul! Are you tempted to carry on digging for the pleasure now? "Our house was one of the first houses built in this town back in 1860 and appearently my back yard was the local landfill." The pottery could partially be 1860's but from the looks of it its mostly 1890-1920 . Usually people use(d) their own yard as a garbage dump, so most of the trash probably came from your house. Used to be fairly common to have a dump off the back of folk's houses. There were some long abandoned homes in the woods behind where I grew up and old pulloffs on the road that people used to dump trash over the hill. Lotsa neat stuff -found alotta old glass mostly, but all so common as to not be worth much. It's cool old stuff but essentially still trash. Even out place in Atlanta had an old garage frame and tons of old car frames and parts overgrown and consumed in the woods. Went digging through it a few times but everything so rusted and gone even if you could make out what it was it wasn't even worth it's weight in scrap. > Great haul! Are you tempted to carry on digging for the pleasure now? Tempted? Maybe a little, however I did need more topsoil last night and found this about 8-10" deep. A jar lid with two little bumps that would have been to hold a wire clip in place, similar to a Bendix brake master cylinder lid. It has two patent dates from 1875 and 1877 and a re-issue date from 1882.